The annual Grace Place Philanthropic Luncheon is scheduled for Thursday, April 27th from 11:30am-1pm at Hendersonville First Baptist Church in Fellowship Hall A. Please join us for a sweet time of celebration and testimony about what the Lord has done in the last year at Grace Place and in the lives of our families. If you plan to attend, please reserve your seat and a meal by emailing us at dvancleve.graceplace@gmail.com or calling the ministry at 615-881-3976! The Grace Place Fall Festival is scheduled for October 21st, 2016. There are many ways that you can help in order to make sure this is a relaxing, entertaining evening for our families. If additional needs come up, we will keep this blog updated! 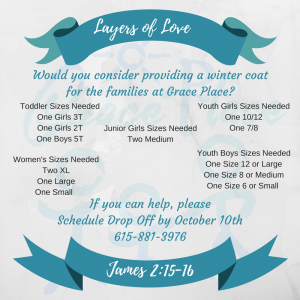 If you can help, please call the ministry at 615-881-3976 to schedule drop off! Thank you for all that you do to support this ministry! 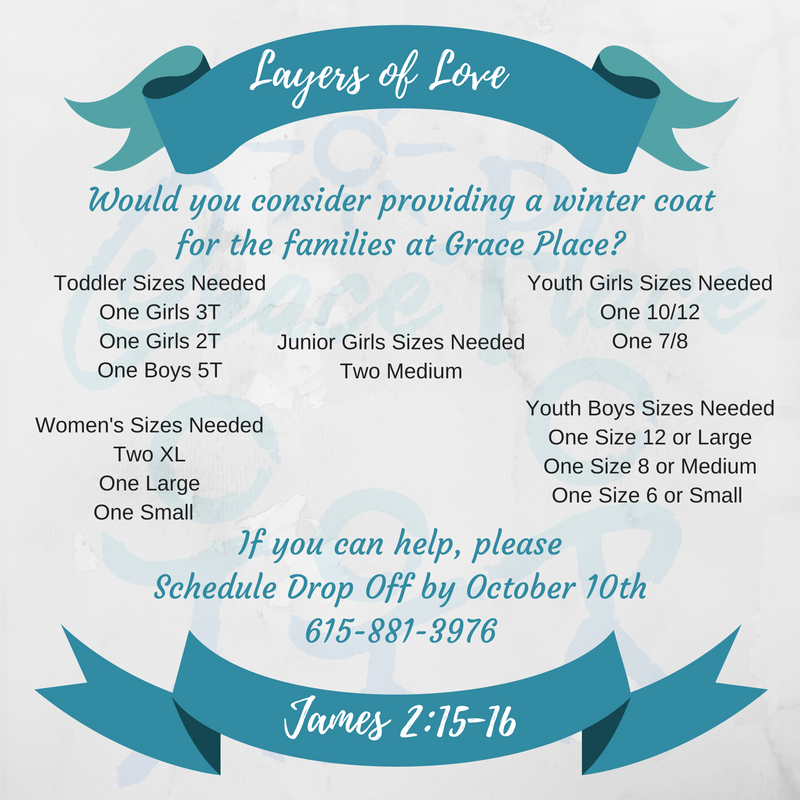 Please call the ministry to schedule drop off at 615-881-3976! Thank you for all that you do to support the work we are doing here at Grace Place! Great informational video and testimonies! Here is a great video that explains a lot of what we offer here at the ministry and some moving testimonies from some of our mothers. We love how well our community loves and supports our families and the work we are doing together! Watch and enjoy! Huge thanks to Brad Bass Productions www.bradbass.com for all of his hard work on the video! Check out our December Newsletter! We are so grateful for this crazy generous community that we live in! Grace Place recently did their very first room-naming in honor of Ashley Smartt of Smartt Steps Dance Studio in Hendersonville, TN. The Smartt family supports Grace Place in so many ways, and we were honored to be a part of this special night. Tena Lee did a beautiful write up in the Star News, check it out here! Channel 4 Feature on GP! Channel 4 recently did a small feature on Grace Place! Check it out if you get a minute! It’s been a long time since I’ve been able to update any of our followers on this blog. Grace Place officially began taking families the 3rd week of July, so we’ve been very busy developing routine and structure for daily operations in the ministry. We can’t thank this community enough for the onslaught of support whether through financial contributions, tangible donations, or the willingness to jump in and help by volunteering. This ministry wouldn’t be here if not for you! Today alone, we’ve received many phone calls and affirmation from the community with the release of this article in the Tennessean. It gives a small glimpse of the incredible work God has been doing in the hearts of the people who began this journey a little over two years ago. Our families at GP are inspiring! Every day we get to see God work in them and we get to witness how crazy the Lord is about every woman and child in this place!